You know how to get this party started. One part "a long time ago", another part "a galaxy far away". Being in the Rebellion meant a lot of things. Fightin' the Empire, blowing up Death Stars, and makin' it with the ladies...maybe even get yourself a princess. Yo-yo-yo-Yoda was spinnin' the R2 unit, crankin' out the mighty tunes, while Ol' Ben Kenobi showed how to get down. Yep, even the Ugnaught knew a thing or two about head-spinning. Yeah, it was a-right. The groove was high and the dancin' kept goin'. 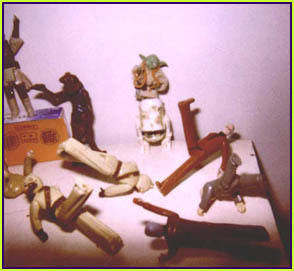 The Jawa knew the moonwalk, and Han and Leia were gettin' nasty. 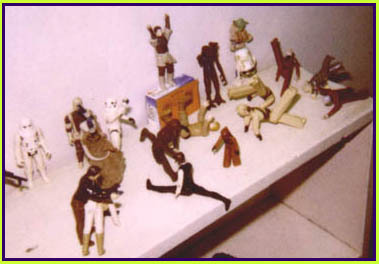 The characters represented on this site are the property of George Lucas, Lucasfilm, Lucasarts, and all variations on the word "Lucas" that Mr. Lucas can think up. This is a not-for-profit site, and we honestly don't mean any harm. We were just bored. Honest. Action figures courtesy of Candy Ellison. Polaroids courtesy of Adele Bienvenu. Scanning, HTML, and design courtsey of Kate Bolin & Dymphna.net productions. Designed July 26, 2000.